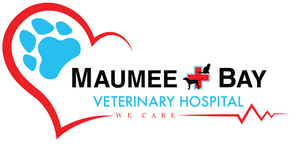 Maumee Bay Veterinary Hospital - Veterinarian In Oregon; OH; USA :: Overweight Dog? Here's Some Tips! FACT: Almost 50% of dogs in the USA are overweight and this number is on the rise! Dogs do not need variety in their diet like people do. There is no need to change foods or flavors – this only makes it harder to reach your dog’s goal weight and worse can cause health problems such as gastrointestinal upset or pancreatitis. Losing weight is not easy but, with time and commitment on your part, you can help your dog get back in shape! Even a small amount of weight loss can have a dramatic effect on your dog’s health and happiness! Weight loss improves quality of life and reduces the risk of serious health problems! It may even lengthen their life span as studies have shown that overweight pets’ lifespan is on average 2 years less than their ideal weight counterparts. Let us help you work up a diet plan that will be tailored to your Dog! Not all dogs are the same and so there is not “one plan that fits all”. Some like canned food versus dry food. Some graze all day and some meal feed. We will take this into account with our recommendations but in turn we need you to be open and honest about anything that the dog is being fed and also what is and isn’t an option for you. Are treats a regular part of your dogs day? That’s ok! It’s ok to still give your dog treats as long as we take this into account when we are calculating out how much your dog should be fed! So just let us know if you need to be able to give treats once daily or ten times daily! For your dogs health it is important that treats not excess 10% of your pet’s total daily intake. Here are some tips to cut calories yet still give treats (even “tablefood”)! 1. Switch to a lower calorie option: For example 1 oz of lean chicken has 52kcal, 1 large egg has 82kcal vs ¼ cup green beans is 9kcal, 1 medium carrot is 21kcal. Remember that healthy doesn’t equal low calorie – medium banana has 101 kcal! 2. Break treats up! Dogs love treats but they don’t measure them before they gobble them down! A small treat is still exciting and rewarding. Take your dogs treats and break them into small pieces (not in front of them!) and have these pieces ready to give instead of a full treat when the time arises. 3. Homemade Diet Dog Treats – 1 ingredient! canned version of your dog’s food! 1. Open the can and shake the loaf out. 2. Cut the loaf into 1/4 inch thick slices and then cut slices into small, pinkie finger-nail sized pieces. 6. Even homemade treats should not exceed 10% of your pet’s total daily calorie intake because heat alters the nutritional characteristics of the food.